It is probably easier to id leafbirds by the females. For the Greater Green Leafbird Chloropsis sonnerati the female has a yellow throat and yellow eye ring. 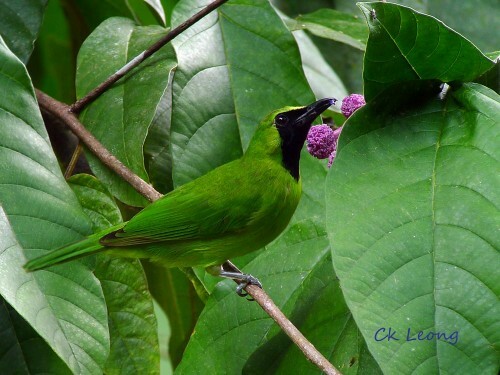 The male has its throat and face black, quite like the male of the Lesser Green Leafbird. Both birds are found in primary, secondary and peatswamp forest but the Lesser is a lot more common.